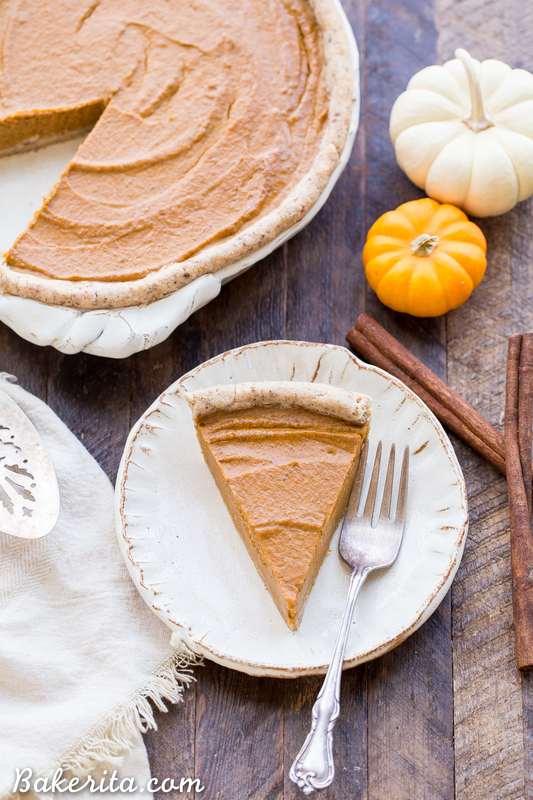 This Paleo + Vegan Pumpkin Pie is smooth, creamy, and perfectly spiced, with a flaky crust that you’d never believe is gluten-free, paleo AND vegan. This is allergy-friendly pie will be a holiday dessert staple. This post is sponsored by Sprouts. Have you made a pumpkin pie yet this year?! 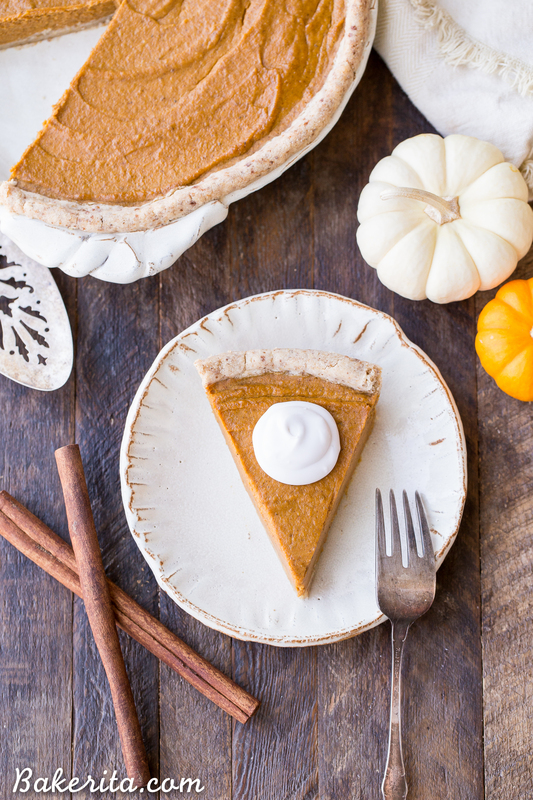 Usually pumpkin pie is a November treat for me (I like making them around Thanksgiving time), but I’ve already noticed a major uptick in traffic on my Paleo Pumpkin Pie recipe from 2 years ago, and I’ve been tagged in photos of you guys making it! Clearly, people like to get their pumpkin pie on alllll fall long. I’d probably be in that camp too, if it wasn’t still 80 degrees here in San Diego…I’ll stick to my no-bake pumpkin cheesecake until it cools down a bit! 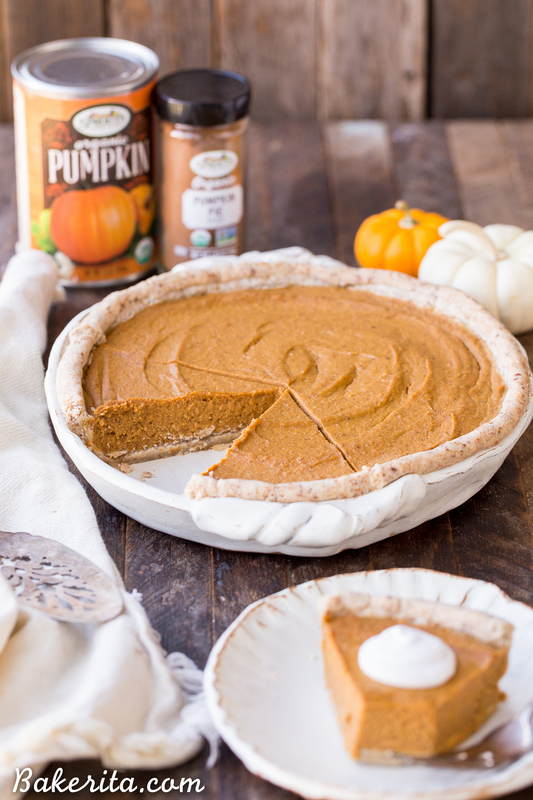 I did turn on my oven to make this paleo AND vegan pumpkin pie for all you pumpkin pie lovers, though! I had never made a vegan pumpkin pie before, and I was concerned with it setting up and staying as creamy as traditionally non-vegan versions are. I had such success with these Pumpkin Pie Crumb Bars though, and knew I could use a similar filling here and have it be ultra creamy. Instead of eggs, which are traditionally used in pumpkin pie to thicken up and firm the filling, this one uses tapioca starch (AKA tapioca flour). The starch is so fine that it doesn’t add any grittiness or “flour” taste, it just helps absorb some excess moisture to let the filling set to be firm, but also super creamy. One of the other ingredients that helps make this so lusciously creamy is a couple of tablespoons of almond butter – the extra fat adds a luxuriousness to the filling. I sweetened with maple syrup, but you can also add a little coconut sugar if you prefer a sweeter pie. I skipped it this time, but I’d recommend tasting the mixture after it’s all made to see if you want to adjust the sweetness or spice levels. Speaking of spice, I used Sprouts pumpkin spice mixture + allspice and cardamon, and in the notes section I gave my amounts if you’d like to add all the spices separately instead of using a premixed pumpkin spice blend. And all that filling’s going to go somewhere right?! Here, it’s making it’s way into a flaky paleo and vegan pie crust. I use almond flour and tapioca flour, which I find create a nice, light texture. Flax seed meal is also in there to help bind, and a little coconut sugar to sweeten. Coconut oil is worked into the dry ingredients to help it get super flaky, too. Make sure you give the crust a nice parbake to golden brown before pouring in the filling so it’s not soggy or undercooked! 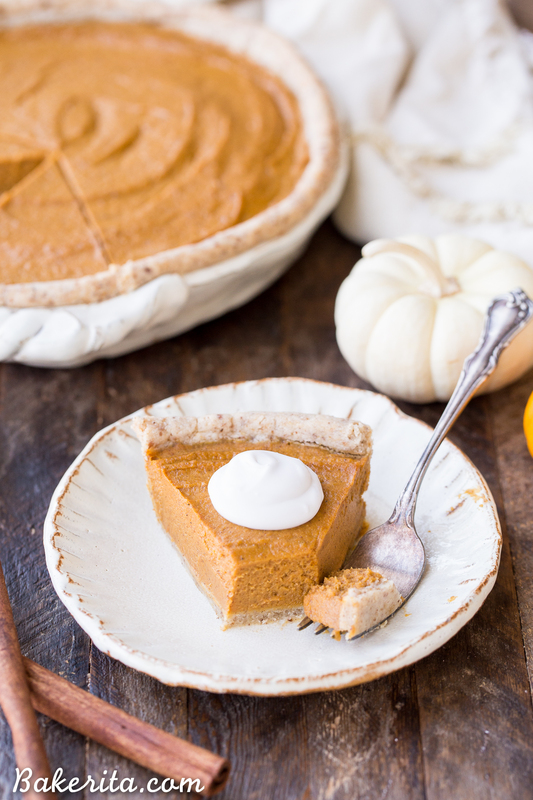 This paleo and vegan pumpkin pie is super creamy, perfectly spiced, and incredibly delicious, with a crisp and flaky vegan pie crust. This is a recipe you’ll definitely want on your holiday dessert table! 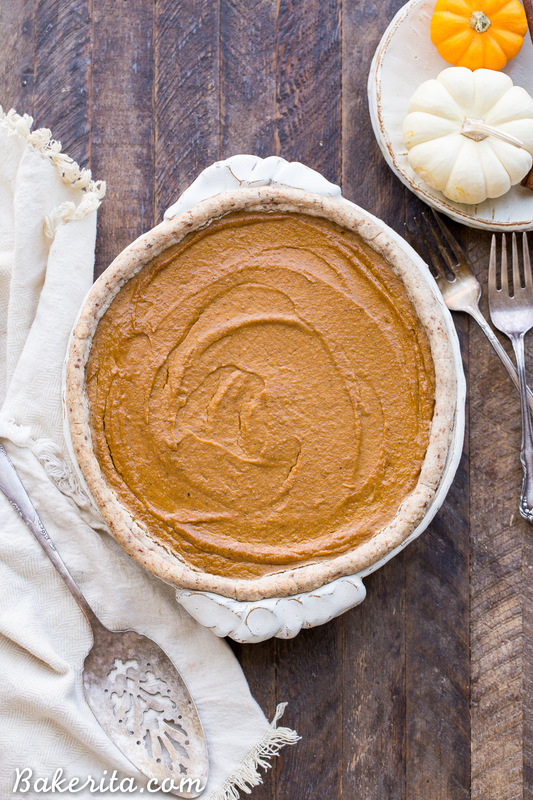 This Paleo + Vegan Pumpkin Pie is smooth, creamy, and perfectly spiced, with a flaky crust that you'd never believe is gluten-free, paleo AND vegan. This is allergy-friendly pie will be a holiday dessert staple. Wrap the dough in plastic wrap and refrigerate for at least 20 minutes or up to 48 hours. Roll out your dough in between two sheets of parchment into a 12-inch circle. Lay dough into a 9-inch pie dish (not deep dish). Place in the freezer while you prepare the filling. Dock the crust with a fork and par-bake for 10-20 minutes or until very light golden brown around the edges (10 minutes for a thinner, metal pan or closer to 20 minutes for a glass or ceramic pan). In a blender, combine all of the ingredients for the filling and blend until fully combined. Pour the filling into the prepared pie crust. Bake for 45-55 minutes or until the the center of the pie doesn't jiggle. Let cool for at least two hours before serving to let set. In place of the pumpkin pie spice, you can also use 1 teaspoon cinnamon, ½ teaspoon nutmeg, and ½ teaspoon ground ginger. This post is sponsored by Sprouts and as always, all opinions are my own. Thank you for supporting the brands that support Bakerita! This is seriously SUCH stunning pie, Rachel! Such a healthy AND gorgeous version of pumpkin pie and so perfect for the upcoming holiday season! This looks so GOOD! My dad’s gluten free so this definitely is in my fieldhouse and I can’t wait to try it out this year:)) the fact that it’s healthy also makes it a perfect dessert for after thanksgiving! I hope you love it Emily! Is there any other flours I could use in place of Almond flour? I want to make this for my family this Thanksgiving but my MIL has a nut allergy. I’m thinking a mixutre of different flours? Or even a gf flour blend? Hi Sarah, I haven’t tried any other flours here so I can’t make any guarantees. A gluten free flour blend should work, though! Hi! Do you think I could substitute coconut butter for the almond butter? I can’t do seed or nut butters, but I really want to try this filling! Thank you! Hi Kyli, I haven’t tried it but that should be just fine!! Wonderful. Thanks for getting back to me! Hi! Will this be ok to make ahead of time like traditional pumpkin pie or best to eat the day you make it ?